To interested stakeholders for a nominal value, no ICO occurred. To reserved pools, for specific uses later, which are controlled via on-chain multi-signature functionality by various long standing and trusted members of the community. NEM Holdings Ltd: A company limited by guarantee, with one member (the Trust above). It is primarily a governance layer with a board of directors responsible for ensuring subsidiary companies operate within their mandate but little operational activities. 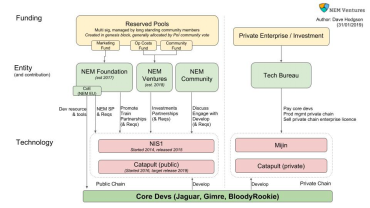 NEM Ventures Ltd: A company limited by shares, owned by NEM Holdings Ltd which manages the community assets and invests in commercially viable projects within the NEM ecosystem.